The three-point line has been a part of the NBA for 37 seasons. Since its introduction, 2,773 players and logged at least one minute in the NBA and 1,120 tallied at least 5,000 minutes. Only seven of those players did not attempt a three-pointer, difficult to accomplish given that last-second heaves count as legit field goal attempts even if a miss flies several rows into the bleachers. Shaquille O’Neal went 1-for-22 from three over his career. The amazing Manute Bol attempted a few of them from 1986 to 1988 before going 20-for-91 in 1989. Bismack Biyombo, stone hands and all, hoisted one last season. Michael Olowokandi played 13,129 minutes, technically the second-highest total among all players whose careers started after the 1978-79 season and finished without a single shot from beyond the arc. James Donaldson nearly doubles Olowokandi’s minute total at 26,222 without a three-point attempt, but his career lasted from 1981 to 1995, his last season when NBA teams finally surpassed 10 attempted threes per game in part because the league shortened the distance of the above the break three-point shots from 23 feet and nine inches to 22 feet. The league was slow in their transition to today’s pace-and-space era, but it was even slower to get teams comfortable with, like, shooting a three-pointer once in a while. These players are typically low-usage players who score around the rim, possibly a good chunk of those opportunities from their own offensive rebounds given their above-average offensive rebounding (five percent is about average) and below-average assist percentages (12 percent is about average given AST/FGM/5). They also make up for their lack of spacing on offense with their rim protection on defense. Nikola Pekovic is an exception, a career that is or nearly is done at this point, but at his best he was an absolute load to handle in the post and a wonderful compliment on offense to Kevin Love’s shooting. The tradeoff was his defense because of his flat feet and lumberjack body, but he made up for it somewhat by not fouling. By multiple measures, Olowokandi was the worst player of the seven, the largest liability on offense by Offensive Box Plus/Minus (OBPM) and racking up not just the worst Value Over Replacement Player (VORP) of the bunch, but the worst VORP dating back to 1974. He was a very fitting center to play with prime Kevin Garnett , who I wrote about yesterday. 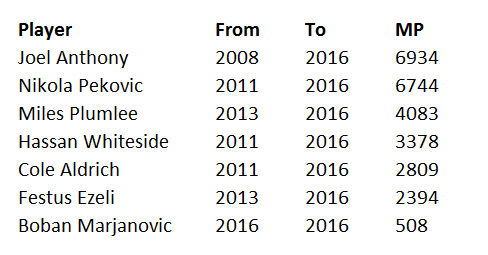 All of the players below Anthony and Pekovic seem to have multiple seasons ahead of them, allowing them to surpass those top two players. Boban Marjanovic, a backup center with over 6,000 minutes to go, probably won’t get there, though. The player I would most watch out for is Hassan Whiteside, 27 years old and a lock for major minutes next season, but also a player obviously conscious of his statistics. Sure, that means he’ll have plenty of opportunities to get a defensive rebound in the final seconds of a quarter, but taking a slight hit to his field goal percentage to attempt a full-court heave doesn’t seem like something he would do. For now, Olowokandi’s minute total without a casual three or half-court heave looks untouchable, and then there’s James Donaldson’s 26,000+ minutes. Whiteside would have to play five, maybe four full seasons to reach Olowokandi, but he would need over 10 to reach Donaldson. By that time, the NBA will have a four-pointer, probably. This record might be unbreakable until a rule change allows for only tallying half-court heaves that are made. All stats are from Basketball-Reference. I love you.